2017 is over and I’ve got 17 books I loved this year. I’m going to lump any series I read together. Below is my complete list of top 17 books. It was really hard to pick a top 17 honestly and I struggled with it. I read 121 books in 2017 and a lot of them were very good (3-5) star reads. My goodreads overview is here. 1. Shades of Magic by V.E. Schwab – this was my first finish it series and I can’t believe I waited so long to read them. The best series I’ve read recently and such an adventure to take in. This is what aging feels like I think? It’s like HOLY CRAP! We’ve got one month left until the new year! My biggest goal for the next month is to finish A Darker Shade of Magic series (which I may be done with this week honestly). Read a few ARCs I have sitting around including Zenith, Tess of the Road and a new motorcycle club romance. I’m pretty excited I’m at 113 books already! What are your reading goals for the last stretch? Did you hit your goal yet? Are you already thinking about 2018 reading goals? It’s the most wonderful time of the year! It’s finally fall and the south is kind of cooling off. Kind of. September included some good reads and some okay ones. I actually DNF’d one book this month too. Currently sitting two books away from my goal for the year of 100 books. Every month I think about wow that was a quick month, but damn I read a lot of books. 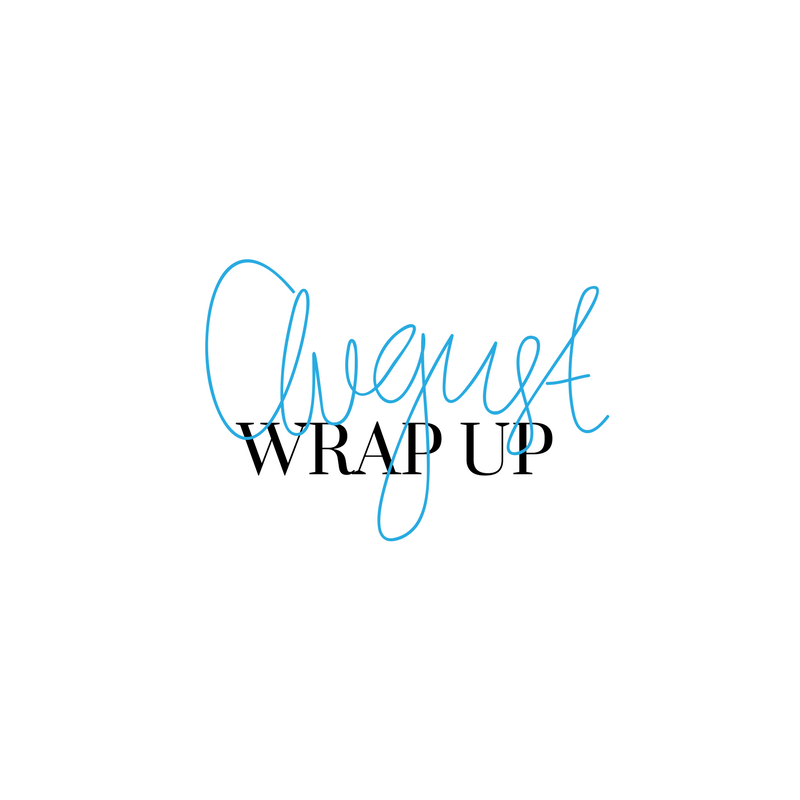 So Here we go through my August Wrap up… I definitely finished a lot more books than I ever expected to. Also I think I’ve narrowed my book likes in enough to avoid reading books I won’t enjoy. Though they do pop up occasionally. I’m currently 20 books ahead of schedule for my reading goal of 100 and I’m hoping to possibly hit 150 this year. Every Heart A Doorway by Seanan McGuire 5/5 – my library finally got this in and I finished it very quickly. This was delightful and nothing like what I expected. It’s a really cool world and I can’t wait to read the other ones in the series. When Dimple Met Rishi by Sandhya Menon 4/5 – Can you just say cute? Like this book is the definition of gushy mushy sweet. I adored the characters and how it all unfolded. It’s sweet it’s a sugary treat on a bad day. Can’t recommend the cuteness enough. The Strange and Beautiful Sorrows of Ava Lavender by Leslye Walton 4/5 – This was part of my #makemereadit challenge. I was surprised by it. It’s magical realism so not for everyone, but my god was it a beautiful read. Murder on the Orient Express by Agatha Christie 4/5 – My first time reading Agatha Christie. I might be hooked now and need to work through some of the backlog. I knew the premise for this one a good bit, but I didn’t know the whole story. Simon vs The Homo Sapiens Agenda by Becky Albertalli 4/5 – Another super fun one that I read because of the #makemereadit challenge. It was enjoyable even gave me cravings for oreos. Sanctuary by Rebekah Weatherspoon 4/5 – Full review here go read this series it rocks! Levar Burton Reads – has become an essential for me every week. Okay I’m not caught up, but I love listening to these and experiencing so many incredible short stories. Greedy Pigs by Matt Wallace 4/5 – this is talked more about in my reading quest week 1 wrap up, but I enjoyed it a lot. Tampa by Alissa Nutting 3/5 – This is the most fucked up book I’ve ever read. I don’t know if I’ve ever rooted more for a main character to get in trouble, but Tampa does that. It’s not for everyone and I think you can easily tell from the plot summary if you could read it. Homegoing by Yaa Gyasi 5/5 – This was book club this month. Amazing beautiful story. You can watch us discuss it here. I also go more in depth on it during my Reading Quest wrap up. Hamilton The Revolution by Lin Manuel Miranda 4/5 – Great audiobook! Enjoyed the back story. Speak by Laurie Halse Anderson 4/5 – So glad I read this and I wish I read it sooner. The Ghost Bride 3.5/5 – I wanted more from this. I wanted more story it ended too soon it didn’t give me enough. Still worth a read. What book did you read this month that you loved? Continuing on last week’s post. Here is the last half of books I’ve read this year! I apparently can’t resist her plots, but never leave happy. Not sure why I keep trying them when I find myself not happy afterwards. This book. This book gave me so many various emotions and was such a good read. It really makes you reflect on your choices and the what ifs around your choices. It’s intense it’s emotional it’s a wonderful book I can’t recommend enough. Another beauty and the beast retelling. This one was pretty good for a modern take. It was fun to read and overall enjoyable. I’m excited to read more in this fairy tale series. This cover is deceptive. I expected something else, but it was a good super quick read. I love Price and her writing. I’ll preface with that. I’m a big fan of her Haven series (that seems to never be finishing). This Alex Craft novel just didn’t knock it out of the park like the other ones did. This was a book club pick. Amazing concept just not amazing execution. I wanted more from it. I’m still planning to eventually read the sequel to this though because the idea of time travelling in a pirate ship makes my day. This was sooo fun to read! I love a good regency with some twists. I love when someone is pretending to not be interested in the heroine only to finally give in and have the happily ever after. I pretty much can’t stop buying Keeland/Ward books. The entire concept of pretending to not be who you are and having to figure out how to reveal it. The book ran a little long, but still love these types of plots. Another book club pick. I had to get the physical copy which is so incredibly novel as it is’ formatted like an ikea catalog. Get it from your library and give it a chance. It’s spooky but not overly. Persephone and Hades, but YA’d. I just got the rest of the series from the library and am excited to finish it. Alright. I’m here for this reread this year. It has to happen. I’ll probably do a blog series on it. I read the series through college originally. I recall it being amazing and super intense. The intro into it was mediocre, but I know it’ll only get better. I decided to slowly work my way through MacLean’s previous works. This one was good, but not as much fun as her current one (Scandal and Scoundrel). This one was a galley. I didn’t love it and it wasn’t what I wanted from a futuristic retelling of Beauty and The Beast. I went in expecting Marissa Meyers and left just feeling okay. I need a fan just thinking about this one. WOOO. It’s good. Really good. Weatherspoon is a great writer. She writes diverse characters with strong plot lines and character growth. Seriously love her writing and can’t wait to read more. Another book club selection. I’m glad we revisited it. I really hadn’t read this one since I was a little kid and it was just as delightful as I remember. Another Beauty and The Beast retelling. This one rocked though. Well written, well thought out and unique. I love it when Beauty is a hunter and really sure of herself! This is a unique but fun book. I enjoyed all the characters and watching the story unfold. It was perfectly suited to an audiobook too. I was hyped to read this. The plot and everything sounded awesome. I was left dragging my feet through the mud to finish. Seriously not that great and the ending wasn’t even a cliffhanger it was a literal cliff. Well written super predictable but enjoyable YA. I knew the plot twist from a mile away. I enjoyed the story itself and enjoyed the writing even more. I can’t wait to read another Nicola Yoon book! Children of gods, travelling circus and adventure. I loved this book. It really goes off the travelling circus route quickly, but I fell so in love with Cat and Griffin. The reveals were great throughout the book. I can’t wait to read book 2 and 3. What could have easily been a 4 star book got knocked down for some really uncomfortable condom usage talk. Seriously uncomfortable. Past that the characters were great and fun read about. I love the Sin Du Jour series! It has been a really great novella to read every few months. Wallace created a ton of great interesting characters who I keep coming back to see again and again. I hadn’t read this book and it’d been sitting in my TBR for a while. I’m thrilled it turned out to good and that I want to continue the series. That will take a while though cause I can’t handle paying full price for the books later in the series. Windfall quite possibly has the best character development I’ve seen this year. The concept of the story is awesome I mean buying a lottery ticket for your friend and them winning? I loved seeing Alice become a new person and grow through this journey. Then Teddy her best friend really does a 180 once he figures out what is important in life. Overall it’s a great book and I highly recommend it. Full review coming friday and will be linked here when it posts. But really enjoyed this one! Let me know if you have a favorite book you’ve read so far this year! My TBR is never full enough! note: Any links to Amazon are affiliate links. Hi there. I’ve started to book blog again. It’s been a while and I’ve dabbled on and off in this hobby, but reading has always been a constant in my life. So here I am ready to share my insane reading habits. and then you know like this because look at these books!! Check out below for the first 25 books I’ve read this year!